About every 2 -3 months, I remember with delight to make Sri Lankan lentil and rice pancakes. In a gluten free household, they are one of our favorite breakfast foods, so hearty and satisfying – full of protein and carbs –yummy! Still, I can hardly even think the words “Sri Lanka” without immediately being transported to 1984, the year we got married and the year we lived near our friends Diane and Charlie in Los Angeles. Diane had been my best friend in high school and co-incidentally we both moved to the Los Angeles area and met engineers who got jobs for the same company, Hughes. We were in each other’s wedding parties and married within a month of each other in the same beautiful little glass church atop Palos Verdes. Our interests ran alike: skiing, sailing, travel. Before long we both had sailboats. There was an undercurrent of competitiveness as one or the other of us got a bigger sailboat, or a better job, or a cuter house . . . . but I remember the intense pang of envy that came up when Diane and Charlie got the chance to travel to Sri Lanka. They came back with totally cool stories and decorated their little house with Sri Lankan batiks and photos of themselves riding elephants! It looked so exotic, so amazing, so fun. They did not come back with Sri Lankan recipes, however, and the course of our lives fairly soon thereafter took us to different parts of the country to have and raise our families. While we didn’t lose touch, we rarely saw each other for the next 25 years. So forgive me as I meander over to another completely different memory triggered also by these pancakes, for the recipes came to me another way, years later after we had children. I learned how to make this simple culinary delight in Hawaii on a trip where we spent time swimming with wild dolphins. On this occasion we had been invited to stay with a friend who lived on the northwest corner of Oahu. They had a little cottage a few blocks from the ocean. She was a fellow American whom we met at a meditation retreat, married to a copper artist from Sri Lanka, who was also the primary cook in their household. He made fabulous dishes usually featuring wild plants and exotic trees from their abundant garden and always accompanied by lentil pancakes and sambol – a coconut curry condiment. What a sweet vacation this was for us! Their neighbor, Terry Pinney, who lived on the ocean, was a fascinating woman who made her living arranging for autistic kids to swim with the wild dolphins that frequented the sea near her house. She said she had a psychic connection with the dolphins that allowed her a closer relationship. While this was fascinating in itself, her stories of working with autistic children were particularly heartwarming. She had other stories about dolphin research too. My favorite was about a friend of hers who studied dolphins in captivity. The researcher felt a little sorry for them and on a whim decided to teach the mother and baby dolphin how to paint – no kidding!! I saw the videos of it. The researcher strapped a giant paintbrush to the head of the dolphins and then hung one giant palette of paint colors and one giant empty canvas from the dock. The dolphins learned how to go up to the paint and get a color on their brush and then paint it on the blank canvas. Incredible! She did discover something as well. The baby only painted with primary colors while the mother painted with all colors – so fascinating. I read recently you can now arrange for a “painting with the dolphins” vacation . . . isn’t life grand? Anyway, Terry knew just where and when to go to find the wild dolphins. Our friend let us borrow her kayaks to get offshore a bit to try. At Terry’s direction, we kayaked out to an empty bay and then, as instructed, mentally called the dolphins to come find us. Sure enough before too long a large pod came to visit. 9 year old Jaime was fearless and absolutely in kid heaven. She jumped out of the kayak and went swimming with the pod. One dolphin singled her out. I can still see the look of total delight on Jaime’s face when she reported that one of the dolphins talked to her! She said the dolphin looked her in the eyes and squeaked. She squeaked back! It was obviously a peak experience for her. Unfortunately, her 6 year old little sister had a peak negative experience, deriving from a fellow kayaker who commented that the bay was teeming with tiny stinging jellyfish. Truthfully, they did sting, but it was very slight and had no lasting ill effect and mostly just felt like tiny bits of sand brushing against you. It was terrifying to a 6 year old, however, and to this day Sanni is petrified of jellyfish . . . . When I think back to that time (minus the car theft . . . ) I remember especially the amazing time with those dolphins, the warm Hawaii breeze and sitting around a low coffee table hearing a little about life in Sri Lanka and eating fabulous homemade Sri Lankan finger food. 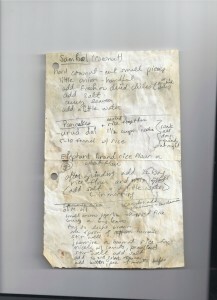 Included is the recipe I copied down back then for the Urud Dal pancakes and Sambol condiment. It’s funny how life comes full circle. Recently we got back in touch with Diane and Charlie and managed to see each other in person. Jay started working for a company in Campbell, CA very close to where Diane and Charlie live in Los Gatos. As serendipity would have it, his travels coincided with Charlie’s 50th birthday and we got to share in his celebration. As we contemplated what gift to give to our friend whom we hadn’t seen for so long, we decided to peruse old photos from our time together in Los Angeles. I came across a perfect one from a Halloween party long ago. The photo is cute of the two of them and I immediately noticed in the background those beautiful Sri Lankan batiks I mentioned earlier. . .
We had the good chance to stay overnight at Diane and Charlie’s current house–a beautiful storybook house that sits atop the hills of Los Gatos with romantic vines crawling over the back portico, a full vineyard and a to die for panoramic view of the Monterey bay– amazing!! Sri Lankan touches still decorate the house, statues and photos of elephants here and there. Diane came to visit us recently as well. We put her in the “elephant” room and because I had recently been reminded of their trip to Sri Lanka from my trip down photo album lane, I made Sri Lankan pancakes and coconut Sambol. We swapped stories and reminisced. It was a perfectly easy and relaxing time–almost as if no time had passed at all. And without further reminiscing, here is one of the simplest most versatile and favorite recipes in my arsenal–wheat free, vegetarian, loaded with protein and delicious! This recipe is so simple you won’t believe it – but you do have to have a little patience as it has to sit for at least 12 hours and is better the longer it sits. · Start with some already cooked rice or other grain. o I usually do this when I happen to have some leftover from another meal. o Note: this recipe is very forgiving and in true peasant cooking fashion, I never really measure anything – it is approximately equal amounts of rice and lentils (a little less lentils), but don’t take that too seriously – it seems to work no matter what the ratios . . .
· Put cooked rice in a large bowl and add uncooked lentils. · Add water to cover and some salt. (You can add more later). · You don’t have to stir or anything, just let it sit overnight. · You may have to add more water if the grains and lentil absorb all the water and the mixture looks dry. · In the morning blend the mixture until smooth – add a little more salt. · You can go ahead and make pancakes at this point, but it is better if you let it sit for one more day. You can let the batter sit on the counter for several more days – or put it in the refrigerator, if you prefer. In a large frying pan add a generous amount of oil (I usually use olive oil) pour batter like with pancakes and smooth in a circle to thin the batter a little. Cook this pretty slowly over medium heat – it takes a while, be patient! When brown on one side, flip the pancake over and cook slowly on the other side. We usually serve these with an over easy fried egg on top and often with the coconut sambol recipe (below) on the side. It’s really good with regular salsa and avocadoes too. We usually serve it for breakfast, but it’s equally good and filling for dinner too. Blend all ingredients together and serve in a bowl on the side. This is another very forgiving recipe, perfect peasant style recipe. I don’t think I have ever measured anything. I just throw varying amounts of the above ingredients into a blender and voila! Everyone loves it–just try it!